Last fall I noticed a small tree had seeded itself among the shrubs outside my studio windows. Thinking it was a wild apple tree, I left it alone. By this summer, it had revealed its true self — invasive Buckthorn — and had invited a grove of Sumac to join it. I included “overgrown shrubs outside my studio windows” on a list of things I was tolerating (and that just might be blocking my creative process) during a recent class with Alyson Stanfield, but hadn’t made any progress with asking my husband or the local landscapers to deal with the situation. I should have known today would be the day when I tossed Ted Orland’s The View from the Studio Door in my bag as I headed off to an appointment. With real fall weather threatening after an extra month of summer, and rain storms moving in for the rest of the week . . . I came home from my trip into town and realized the time had come to take back my view! I could have called my neighbor for help — at age 14 he’s already “tractor certified.” Either that or exceptionally good at marketing his lawn mowing/landscaping services for someone who has yet to earn his driver’s license. My husband also owns a tractor — he’s not officially “certified,” but certainly very competent — however, he wasn’t at home. We have a chainsaw too, but after telling my 85-year old father he was not allowed to use his chainsaw while he was home alone, I thought better of trying ours for the first time. Hell knows no wrath like a woman with a swiss army knife. OK, it was a small landscapers’ pruning saw, but the view of the fall foliage from my southwest studio is now much improved — or at least it will be once I get back out there to wash the windows! There’s nothing like a full moon on the Fall equinox to signal a major transition, but this year seems more exciting than ever! For the past year or so I’ve slotted my activities and hobbies into seasonal time blocks. Some loosely follow the calendar seasons; none follow the strict fiscal quarters that govern my day-job in finance. But in this way, with rough timeframes and selected focal points for each season, I stand a better chance of fitting everything in. I don’t feel guilty about not making quilts during the summer — summer is for gardening and fabric dyeing. 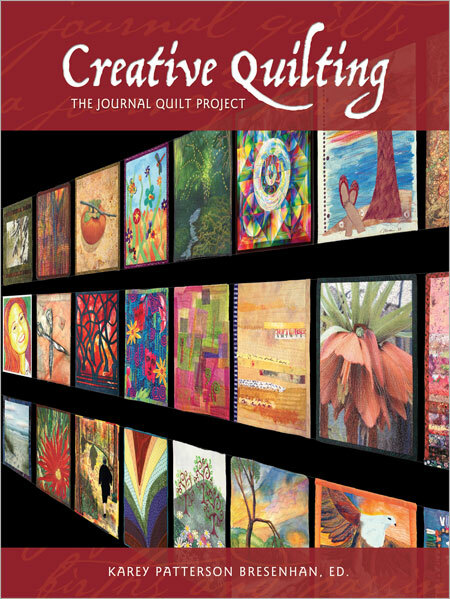 The fall/winter focal points include quilting and other “indoor” pastimes. I’m a perpetual student, in that “back to school” is still a time of fresh beginnings for me. So September is the time to tidy up the garden, harvest & can the last tomatoes, put away the fiber reactive dyes and close down my back porch “wet studio,’ and clean up my main indoor studio in preparation for the fall/winter indoor quilting season. This August I spontaneously enrolled in Alyson Stanfield’s “Get Organized” online class, which caused me to find clutter (physical, mental, psychic, and even electronic) that I never noticed before. So, while I’m still chipping away at the task list I created in that class, I now boast a newly reorganized studio — even the closets! I put up a new design wall, relocated the business/computer, painting/collage, and quilting areas, and purged/revamped my filing system. Whew! There’s nothing like having systems, and creating the routines and habits that make them continue to work after the newness wears off. I’ll share more on these new habits and routines in future posts, but for now I’m off to enjoy a roast chicken dinner — the perfect way to welcome autumn! What are your favorite ways to celebrate the changing seasons?